Please refer to our stock # columbus when inquiring. 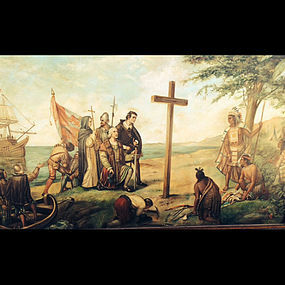 This is a fantastic oil on Masonite painting of Columbus landing at the Indian Islands. This painting is signed and dated 1921 by artist Frank Herbert Zeitler of Germany. Zeitler was born in Germany in 1874 and died in Milwaukee, Wisconsin on July 30, 1940. His obituary, which appeared in the Milwaukee Journal, 7/31/1940, noted that his religious paintings (including murals) and sculptures were in churches in many parts of the world. His work could be seen in St. Francis and St. Joseph's Churches and at Holy Cross Church and Calvary Cemetery, Milwaukee. This painting measures 48" x 82". Possible East coast delivery, Florida delivery possible. You can now buy this painting with Art Money, a service we offer our most valued clients. Art Money will give you a 10 month, interest free loan of up to $50,000 so you can buy the art you love.